Your newborn is absolutely amazing. With every adorable smile and cute little giggle, your day is instantly made better. So it makes sense why you would call your bundle of joy your hero as well. We get it, even if everyone else may seem a bit confused. Maybe the problem is that they can't imagine a hero wearing a onesie and carrying around a pacifier. Sure, you bought the Superman and Spiderman onesies in an attempt to prove to your friends that the best superheroes all wear one-piece jumpsuits but they still just shrug their shoulders. Well, then it's time that you dress your knee-high hero up as a real life hero rather than one of fiction. 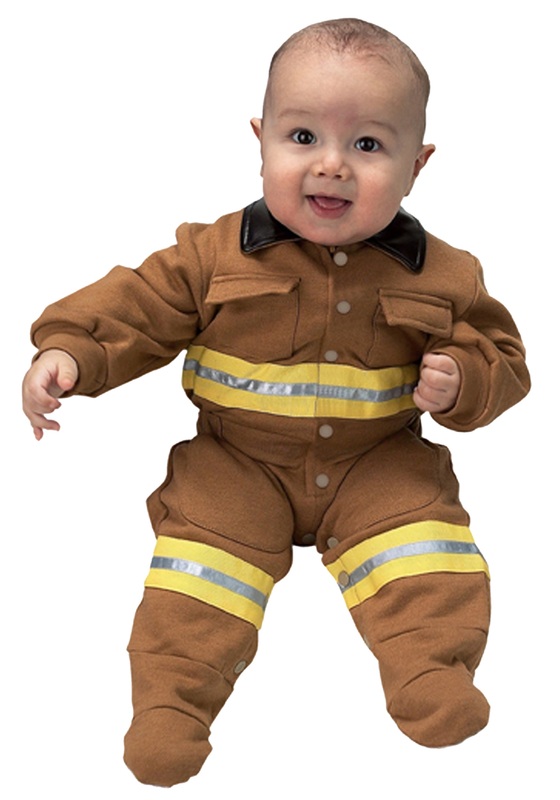 When you dress your little one up in this Infant Firefighter Costume all of your friends will finally be able to see your baby as the hero you see every day. Make sure to grab all of the proper equipment for your tiny tot! An infant-sized firefighting helmet would probably come in handy, after all, you don't want any flames to singe off your newborn's freshly grown hair! Don't forget the toy axe, your kiddo needs to look prepared to bust down any door that is in the way of the rescue mission. Lastly, this is optional, but every great firefighter always has an awesome Dalmatian standing close by and every child needs an animal companion. Once you have your baby dressed up and equipped to save the day you can be sure that you'll have the cutest hero in town! Everyone will be able to sleep safe and sound knowing that if any disaster should strike, your baby will be ready to save the day. Just be prepared for everybody wanting to take a picture with the new local hero!